This is a minor oral surgical procedure that aims to remove an infected tooth root tip (apex) , remove the associated infection and place a filling to cap and seal off the new end of the tooth. The most common reason to consider an apicectomy is persistent infection around a root tip, following repeated unsuccessful conventional root canal work. This infection can cause pain, swelling and discharge over the top of the tooth. The suitability of apicectomy treatment can only be determined after thorough clinical and radiological examination of the tooth. Local anaesthesia is used to numb the area around the tooth. The gum tissue is then gently raised away from the tooth to allow access to the infection and this area is thoroughly cleaned out. The tip of the tooth root is then removed and special cement placed over the new end of the root. This sets very hard and seals off any open channels in the root which could lead to another infection. 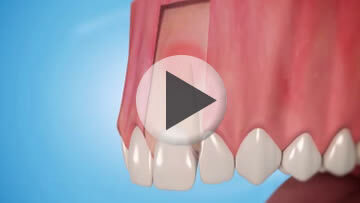 The gum tissue is then put back into place to allow for healing with few dissolvable sutures. This depends on the position of your tooth, the treatment required and whether the operation is being carried out with local anaesthesia alone or with additional intravenous sedation. An appointment for surgery under local anaesthesia usually lasts 60 minutes. When intravenous sedation is used, an appointment usually lasts 90 minutes. The longer time allows for the recovery period needed before you can be discharged home. Will there be any stitches? 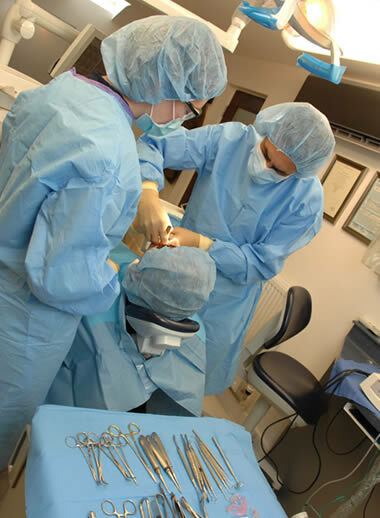 Stitches are used at the end of the operation to complete the surgery. A very fine thread is used to achieve a good cosmetic result, which is especially important if it is for a tooth at the front of your mouth. These stitches are dissolvable and so should disappear after about two to three weeks. As the numbness wears off, the area might become uncomfortable and then you should take painkillers. We will supply you with these, with information about doses. This depends on the operation. If there are any issues in particular to be aware of, they will be discussed with you before surgery. The surgical techniques Mr Elmanharawy uses are designed to minimize the amount of this post operative gum recession. Any new restorations (such as crowns) planned for your tooth by your dentist should only be placed once the gum margin has settled, usually about 6-8 post operatively. This depends on your occupation and how you are after your treatment. It may be possible to return to work the next day. Some people need to take some time off work, especially if the operation has been carried out under intravenous sedation. Mr. Elmanharawy will give you appropriate advice for your particular circumstances. After your surgery, we will give you an post operative information sheet with instructions to help bring about a quick recovery. We will discuss this with you before you are discharged home, to ensure that the information is clear and understood. Get plenty of rest in the first few hours after your operation. Do not rinse your mouth or drink hot fluids. Relieve discomfort by taking the supplied painkillers as directed and use ice packs to reduce discomfort at the operation site. Keep your mouth as clean as possible by gently brushing your teeth as usual. Use salt water mouth rinses (one teaspoon of salt in a cup of warm water) every four hours for seven days. This will help to keep the operation site clean and clear of debris. Avoid smoking. The local action of nicotine in the mouth has been shown to have a detrimental effect on healing after surgery and greatly increases the likelihood of wound infection developing. Continue to take the painkillers and any other supplied medications as directed and use ice packs for the next two to three days. If bleeding is troublesome, you can usually control it by placing dampened gauze over the wound and applying pressure for 15 to 20 minutes (slight oozing can be expected for a short time following surgery). If you have any other complications or require advice after treatment, please call 01793 855335 and leave a message including a contact telephone number. We will return your call as soon as we can.